Getting regular exercise when you have heart disease is important. Physical activity can strengthen your heart muscle and help you manage blood pressure and cholesterol levels. Your provider will tell you what exercise is best for you. Talk with your provider before you start a new exercise program. Also ask if it is OK before you do a harder activity. Take rest periods before you get too tired. If you feel tired or have any heart symptoms, stop. Wear comfortable clothing for the exercise you are doing. During hot weather, exercise in the morning or evening. Be careful not to wear too many layers of clothes. You can also go to an indoor shopping mall to walk. When it is cold, cover your nose and mouth when exercising outside. Go to an indoor shopping mall if it is too cold or snowy to exercise outside. Ask your provider if it is OK for you to exercise when it is below freezing. Resistance weight training may improve your strength and help your muscles work together better. This can make it easier to do daily activities. These exercises are good for you. But keep in mind they do not help your heart like aerobic exercise does. Check out your weight-training routine with your provider first. Go easy, and do not strain too hard. It is better to do lighter sets of exercise when you have heart disease than to work out too hard. You may need advice from a physical therapist or trainer. Either one can show you how to do exercises the right way. Make sure you breathe steadily and switch between upper and lower body work. Rest often. You may be eligible for a formal cardiac rehabilitation program. Ask your provider if you can have a referral. It is important that you pay attention to these warning signs. Stop what you are doing. Rest. Know how to treat your heart symptoms if they happen. Always carry some nitroglycerin pills with you. If you have symptoms, write down what you were doing and the time of day. Share this with your provider. If these symptoms are very bad or do not go away when you stop the activity, let your provider know right away. Your provider can give you advice about exercise at your regular medical appointments. Know your resting pulse rate. Also know a safe exercising pulse rate. Try taking your pulse during exercise. This way, you can see if your heart is beating at a safe exercise rate. If it is too high, slow down. Then, take it again after exercise to see if it comes back to normal within about 10 minutes. You can take your pulse in the wrist area below the base of your thumb. Use your index and third fingers of the opposite hand to locate your pulse and count the number of beats per minute. Drink plenty of water. Take frequent breaks during exercise or other strenuous activities. Also call if you cannot exercise as much as you are used to being able to. Ridker PM, Libby P, Buring JE. Risk markers and primary prevention of coronary heart disease. In: Zipes DP, Libby P, Bonow RO, Mann DL, Tomaselli GF, Braunwald E, eds. Braunwald's Heart Disease: A Textbook of Cardiovascular Medicine. 11th ed. Philadelphia, PA: Elsevier; 2019:chap 45. 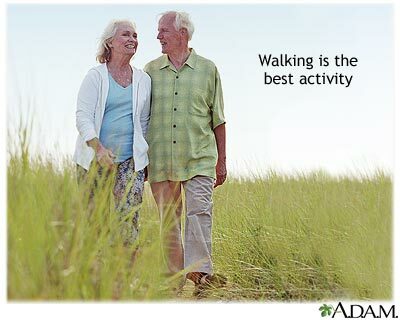 Walking is the best activity when you start exercising after a heart attack. Start slowly, and increase the amount of time you exercise gradually.